Please note the faux eyelets pierced around the scalloped oval and the card itself. Are you familiar with this technique? If not, you may want to pick up the Dec/Jan 2008 copy of Take Ten and read the article titled "Faking It" by my friend and stamping rock star Jen del Muro. The article is illustrated with nearly a dozen adorable cards by the author. While your browsing through the issue, you'll probably stop to ooh and aah over a few cards by some of my other stampin' pals, Kendra Giles and Christina Fischer (one of Kendra's is also the sample for this issue's readers' challenge). I feel famous by association when I see my buddies' work in print -- congratulations, girlfriends!! And be sure to come by first thing in a.m. to see a sample for Jen's weekly Sketch For You To Try. I've already got my card made for it, and I have to say, I think it's quite the cutie! I'm anxious to see if you agree. Hey, since I've got your ear... er... your eyes at the moment, I'd like your input. A couple of my civilian (iow non-stamper) friends have seen my blog and expressed a genuine interest in stamping, but are having a hard time figuring out where to start. I started stamping in earnest about a little over a year ago, and I almost immediately became an SU! Demo. Most of the stamps I bought at first were SU, naturally, and I built up my supplies from the demo shipment up. I learned to stamp from doing the challenges on Splitcoast and through the influence of all of the stampers there. I've never been to a stamping class in my life, unless you count tutorials on SCS or on other stamping blogs. Of course, I buy magazines like PaperCrafts, Take Ten, and Stamp It! (when available), but I don't think I learn that much from them. Anyway, I don't have any great advice to give, and I don't think my methods are necessarily best for the dabbler as I tend to be an extremist when it comes to hobbies. (Have you noticed?!) I'd love to hear what advice you think would be helpful. Thanks!! 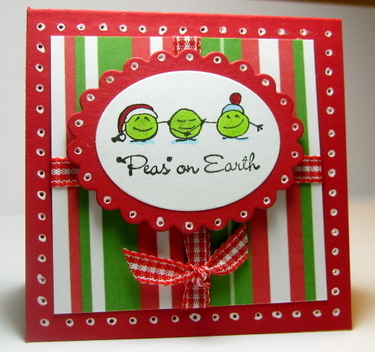 Supplies used -- Stamps: Peas on Earth by Penny Black; Paper: Real Red, Georgia Pacific White, digipaper by My Favorite Things; Ink: Brilliance Archival Graphite Black; Accessories: Copic Sketch Markers, Nestabilities, ribbon, 3-D Dots, paper piercer, white pen. I feel like I have to explain myself to virtually all of my "on-ground" friends. I know you probably don't get the whole stamping/card making thing I do, but it appeals to that tiny little sliver of me that is artistic. You may not be familiar with this side of me, but it's the part that declared Graphic Design as my major before I realized how many drawing courses I would have to take. This posed a problem: I can't draw very well, and furthermore, I don't like to draw. Because I can't draw very well. Anyway, a Finance degree, a law degree, and about thirteen years later, I discovered the medium of rubber stamping. Someone else does the drawing, and I get to do everything else! Is this art? Well, I think so. It may not be Michelangelo, but it will appeal to some more than, say, Robert Mapplethorpe. (Google/wikipedia him if you want, but don't say I didn't warn you.) You be the judge. I made this for Jeanne S and Bad Sherry's first Just Because We Want To Blog Challenge, which was to make a card using glitter. I used the sketch from last week's Splitcoaststamper's sketch challenge (#140) because I didn't have a chance to do it earlier. I bought the sweet little Penny Black teddy bear image when Carter and I went to Kansas City on Thursday for a doctor's appointment (there are two stamping stores in the area of his orthopaedist, which helps to make the 3+ hour drives each way a little more appetizing for Mom), so this is my first time to use him. He's colored with Copic sketch markers and his heart is detailed with red Stickles. The gingham designer paper (dp) is some of my ancient Creative Memories leftovers, and the other patterned paper is part of Cosmo Cricket's Dutch Girl line. The sentiment is from that ubiquitous Stampin' Up! set, Heartfelt Thanks (which everyone has but I for one NEVER use). I am really enjoying the Copic markers I bought from Ellen Hutson's online store. They are just so amazing to shade and blend with. I could never have gotten the subtle shadowing with my water-based markers, and though I do love using the Prismacolor pencils and odorless mineral spirits, the end results are just not as bright. And I do love bright colors! Stamps: Don't Break It! by Penny Black; Heartfelt Thanks by Stampin Up! ; Cardstock: Very Vanilla, Sage Shadow, River Rock, dp by Creative Memories and Cosmo Cricket; Ink: Brilliance Archival Graphite Black, Sage Shadow, Ruby Red; Accessories: Ribbon, red Stickles, Copic Markers, Marvy Uchida mega oval punch and giga scallop oval punch, 3-D Dots.